Mr. K requested a Batman and Superman birthday party this year. I made a tie dyed cake (vanilla cake separated into 4 bowls and tinted with food colouring) then mixed up drop by drop into the pan. When it came to decorating, he wanted the bat signal and the superman symbol. I decided to try working with fondant for this (it was the first time I have ever done it). I made the marshmallow fondant then tinted and made the symbols. I iced the cake a light blue, added the fondant symbols and used a chocolate border with chocolate writing. When it came to decorations, hubby couldn't find any Superman party stuff. I found some printable colouring pages online and printed out a few of the bat signal and a few Superman pages. Set up a colouring station at the kitchen table. I bought a batman poster and we used it to pin the bat signal on Joker (whoever got their signal over Jokers nose was the winner). In terms of drinks and snacks, I made a snack mix (cheerios, gold fish crackers, pretzel sticks, plain popcorn, special k granola and rice krispies multi-grain multi-shapes cereals) and well as strawberries, blackberries and raspberries. We had "Joker Juice" (a mix of cranberry juice and orange juice) and "Invisible Water" to drink. When we were finished with snacks and cake, the kids headed outside for the pinata and then played on the play structure for a while. Mr. K really seemed to enjoy himself and was glad to have his friends over to celebrate with him! 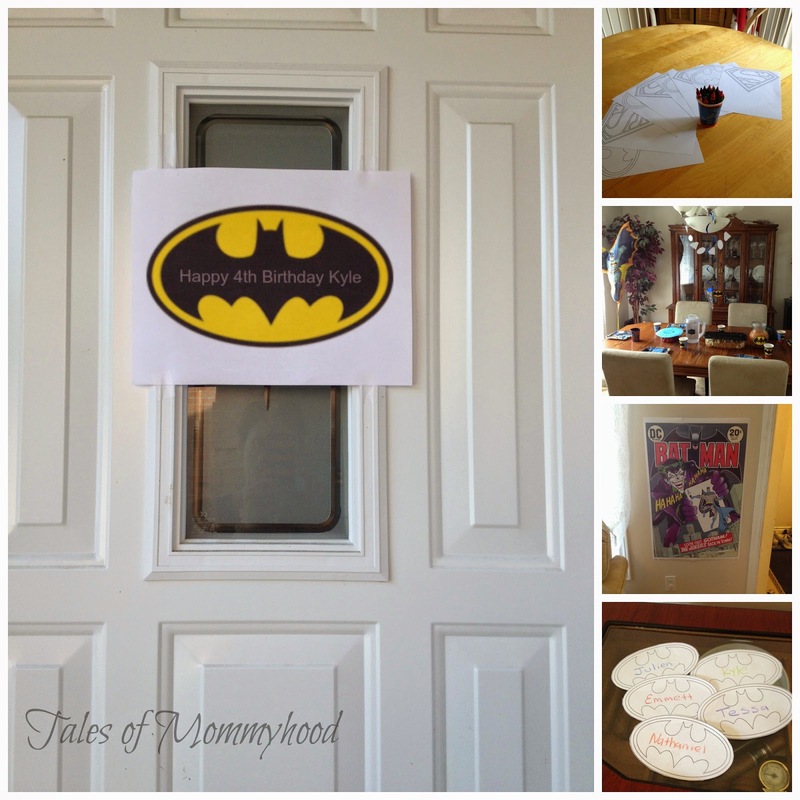 Mr. J had a superhero party for his 5th birthday - have your kids had a superhero party? I never did a superhero party, my boy was not into super heros. He was all about hot wheels, transformers, and when he was really young it was Thomas, everything Thomas. Unless my girl mixes things up a bit and surprises me with super heros lol. Fingers crossed it's anything but Barbie. Anything. I love the Joker Juice! What a great party that must have been! That's a fun theme! My little guys would love Joker Juice, I am sure. Joker Juice..to funny! Thank you for linking up to Party Time and we hope to see you again next week!